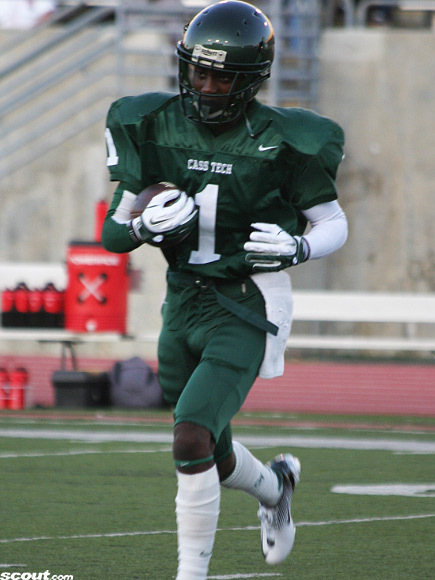 Detroit (MI) Cass Tech cornerback Jourdan Lewis committed to Michigan today. His only other offer came from Toledo, although it was widely assumed that he would be a Wolverine, regardless of who offered. Whether that affected his recruitment is unclear. Lewis is a 5'11", 170 lb. corner who claims 4.4 speed. He made 52 tackles and 8 interceptions as a junior in 2011. He also scored 6 receiving touchdowns, 2 punt return touchdowns, and 3 kickoff return scores. If you look at Lewis's highlight film, there's very little not to like. He has excellent speed, so the claim of a 4.4 forty doesn't seem too far-fetched. On top of that, he has very good acceleration When the ball is in his hands, he's extremely dangerous, showing good vision and stop-and-start abilities. He reminds me a little bit of Dre Bly, the former North Carolina and Detroit Lions cornerback. Due to those ball skills, he might also be able to contribute in the return game. There aren't many clips of him coming up to support the run, so that's a question that remains in my mind. He does show a couple nice hits, especially against Farmington Hills Harrison, but even then it was evident that Lewis needs to add some strength to his frame. He's very narrow in the upper body and can get pushed around a little bit by bigger receivers. Lewis looks to have a future at the field corner position for Michigan. He will enter school when the current starter at the position, Blake Countess, is a junior. Lewis is superb in coverage and I think he's a good enough offensive player to contribute as a receiver at the next level, but that will probably be unnecessary. It's amazing how many cornerbacks Cass Tech has produced in recent years. From Boubacar Cissoko (Michigan) to Dior Mathis (Oregon) to Delonte Hollowell (Michigan) to Kishon Wilcher (Toledo) to Terry Richardson (Michigan) to Jourdan Lewis, that's six FBS cornerbacks in the span of six years. And that's not including Teric Jones (Michigan, class of 2009), who came to Michigan as a running back but played some corner before ending his career early. Most of them were my students and we are so proud of them. Great kids and students, even Boubacar. We wish them the best. Yea Cass Tech has turned out a lot of top recruits, but have ANY produced reliably on a collegiate level? Will Campbell: not yet but had better make it happen soonish; Boubacar Cissoko: we all know how that ended; Delonte Hollowell: special teams player of the year IMO; RJS: wait and see; Dior Mathis: Not yet; Joseph Barksdale: conceded. Cass Tech talent is not necessarily a sure thing. Hopefully Jourdan will turn the tide. Thomas Gordon has been pretty solid and was just a redshirt sophomore. Vernon Gholston was pretty good for OSU. It's a little too early to judge Hollowell, Mathis, Richardson, and Jenkins-Stone.